to life, as soon as we get some rain! 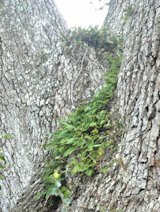 Two good stories recently from the Island Connection about local flora. 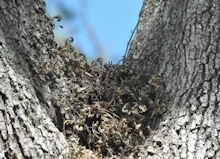 Resurrection ferns, along with the ubiquitous Spanish moss, are frequently found on live oak trees. They both share a symbiotic relationship with live oaks. The second story, about stinging nettles, is worth knowing if you are out as gardener or hiker, especially with kids. These plants can be very annoying if you stick a foot or hand in them; as I found out the hard way a few years back on a biking trip in the UK. I put my foot into a bunch of them at a roadside stop but didn’t feel it right away as I had crew socks on. Later, my English friends had a a good laugh at my expense in the pub as I scratched away. Oddly, there are many recipes for such things as nettle tea, nettle soup and nettle sauce. I’d rather eat a cactus.